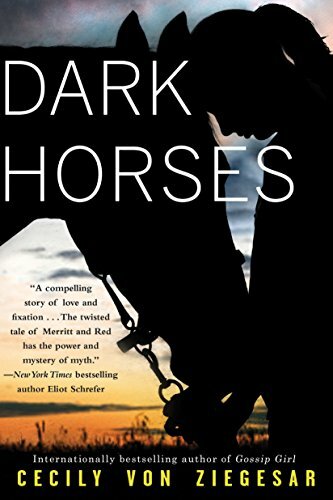 If you like happily-ever-after girl-and-horse stories, skip Dark Horses. The title can be interpreted literally, as a story about dark-colored horses (no), or metaphorically, as a story about unknown contenders who might surprise everyone and win (yes)—but in the main it’s a dark tale of two troubled misfits bred for success but doomed to fail. One of those misfits is a teenage girl in upscale New York City, and the other is a Thoroughbred racehorse from Kentucky. Both break down simultaneously in their separate worlds and are thrust together at Good Fences, “some sort of equestrian-themed loony bin for teenaged girls,” as Merritt says when she wakes up after a bender to find herself there. She is assigned a therapy horse, Red, and the narrative alternates between their viewpoints in first-person voice. Initially it feels weird to hear the horse talking—silently, in his head, as compared to a Mr. Ed–type speaking animal—but as the story progresses, the oddness recedes, and Red becomes a fully fleshed-out character. People with wide horse experience will have no trouble associating his thoughts and his behavior, having probably met a horse or two like him. Other readers might find Red too anthropomorphic, and therefore hard to take seriously, because everything else in the story is realistic. Regardless, both girl and horse suffer from obsession, alienation, and grief. With each other’s love and help, they start to move beyond this crippling combination, but too much damage has been done, and they both turn winning into losing despite everything working in their favor. The author does an excellent job of conveying how Merritt and Red got to their starting points and why they deteriorate. That’s what makes the book depressing: It’s too easy to believe. The supporting cast is also convincing in their strengths and weaknesses. Everybody and their circumstances mix and match in a way that reflects life plausibly, with the exception of how fast some events come together. Then again, life is full of surprising ways that things cohere and disintegrate, and this literary fiction captures that quality. Although the novel is aimed at young adults, it could be unsettling for fragile ones who need hope. Troubled folks of any age might be able to relate to it best because it so clearly expresses their truths, which in turn may help untroubled folks gain insight into what can cause people and animals to become dysfunctional. The horse aspects of the story are more accurate than usual in fiction, and will appeal to equestrians, especially those weary of romanticized or simplified horse stories. Equine lovers or not, readers who take inspiration from protagonists that overcome great difficulties will feel let down. What makes Dark Horses ultimately a strong novel is the level of emotional engagement it evokes. Love it or hate it or in between, the story is emotionally persuasive and few readers will be unaffected. Keeping a box of tissues on hand may help at the end.